Aqualane Shores Homes: H.13122 - Scheduled for completion in May of 2019, this home sits on a southern facing lot, toward the end of the street, with no bridge access to the gulf. Conceived and constructed by the finest team in luxury construction, this A. Vernon Allen masterpiece was penned by John Kukk and designed by Lisa Kahn. Its sprawling floorplan includes: soaring ceilings, 5 bedrooms with 2 master suites, a theater room, an exercise room, a 4 car garage, and a gated entry; as well as, custom European cabinetry, a stately wine room, 10 security cameras, outdoor gas fire pit w built-in seating, outdoor shower, 1000 gallon propane tank with generator, dual staircases, a glass elevator, Sonos in all main living areas, a new seawall with boat slip, and a fully equipped gym with TechnoGym equipment and a long-water-view. The centerpiece of the home will be a dramatic pool, flanked by 6 specimen plants, that emerges from within the home's envelope and culminates with multiple sun decks and an infinity edge. Progress photos to be added shortly. Aqualane Shores Homes: A Rare Opportunity To Own One Of Naples Most Coveted Waterfront Properties!! With Approximately 450+/- Feet Of Waterfront (Half On The Bay And Half On A Protected Waterway) And One Of The Most Spectacular Views On Naples Bay, This Property Won’t Be Available For Long!! The Main House Offers A Soaring Ceiling And Features A Wall Of Glass To Take Advantage Of The View! Wake Up Every Morning In The Master Bedroom To An Unobstructed View Of The Yachts Docked At The Naples Yacht Club And An Expansive View Of Naples Bay. There Is An Additional Bedroom In The Main House As Well As A Separate Den Just Off The Large Relaxing Lanai Covered With Jasmine And Overlooking A 2500 Gallon Koi Pond. Add The One Bedroom Guest Bungalow With It’s Own Kitchenette and Bath, A Large Pool, The 15x30 Covered Cut-In Slip, As Well As An Additional 12,000 Pound Lift, All Backed Up By A 20,000 KW Generator! There Is Another Lanai In The Front To View The Boats As They Navigate The Bay, A Fifty Foot Dock With Water And Electric Where You Can Either Sit And Watch The Frolicking Dolphin Or Put Your Fishing Poles To Work Landing A Large Snook!! The List Goes On!! "Shangri La" Awaits It's New Owner!!!!! Aqualane Shores Homes: Incomparable Coastal West Indies style retreat on a coveted sunset western exposure waterway is coming to Aqualane Shores in Spring 2020. 1990 6th St S sits on a rare 'finger' street with excellent aqua vistas and developed by one of Naples' finest in Michael Mullen. This uncompromising estate is slated to begin construction in April 2019 with opportunities to customize finishes to your specific tastes. This meticulously designed home will boast state of the art finishes framed by an open floor plan and lead to the phenomenal outdoor resort-style amenities, including infinity edge pool and spa with a custom dock just beyond for the boating enthusiast to quickly access Naples Bay. 5200 square feet includes five bedrooms and den, 7 bathrooms and will be graced by Legno Bastone hardwood floors, custom Ruffino millwork, Wolf and Sub Zero and more to promise a truly authentic, rare and phenomenal hand crafted generational estate in Aqualane Shores. Aqualane Shores Homes: Stunning brand-new construction home is now completed for your ultimate enjoyment of living the coastal lifestyle. This magnificent waterfront dream home was built by CK Custom Homes, interior designed by Canada Design Group and elegant furnishings tastefully orchestrated by Clive Daniel Home are sure to please the most discriminating buyer. Upon entering through the exquisite custom front door you see soaring ceilings bringing in the natural light with walls of glass doors retreating to expansive outdoor living spaces. The gourmet kitchen is a delight for the culinary enthusiasts, offering high-end appliances, wet bar and beverage center, relaxing fireplace in the family room, twin VIP suites upstairs each with private balcony overlooking the canal, great floor plan for entertaining, infinity pool with spa and outdoor kitchen, convenience of a private elevator, generator, storm windows and doors. Boating enthusiasts will enjoy a new seawall cap, shore power, and large dock. All this while only a few blocks to our world-famous beaches, close to downtown Naples exquisite shopping & fine dining, and minutes to unobstructed access to the Gulf of Mexico. Make your dreams come true. Aqualane Shores Homes: Iconic modern masterpiece of design and detail. Featured in the upcoming issue of Florida Design Magazine, this spectacular home is positioned on a double-sized 0.75 acre lot, totally private with no overlooking homes, just a walk to the beach and historic downtown 3rd St S. This new construction property encompasses its own private botanical lake stocked with numerous varieties of fish, the home is cantilevered to feel as if it floats. Dominated by walls of glass and imposing roof overhangs, this sleek and sophisticated residence is designed to capture the days ever changing light. This exquisite masterpiece of iconic modern architecture and design is the inspiration and vision of Lime International and was skillfully penned by renowned architect, Gerald Yurk. The home encompasses unique products and finishes from around the globe, hand-picked to blend perfectly into the refreshingly clean design. Celebrated by numerous architectural publications, rarely does a piece of Art like this ever come to the Naples market. Do not miss this opportunity. Aqualane Shores Homes: Designed for today’s Southwest Florida waterfront lifestyle, this newly constructed luxury home is located in Aqualane Shores on the broad waters of Flamingo Cove. Fully furnished with exceptional quality workmanship and materials throughout. Sophisticated, Classic and Transitional. Enter a tall foyer into a spacious and bright living area perfect for entertaining in style. Featuring 5 Bedrooms + study with ground floor master and guest en-suite, chef’s kitchen with large island, butler’s pantry, climate controlled wine cellar, 2 laundry rooms, private elevator, 2 fireplaces, 2nd level living area and covered balcony, summer kitchen, roll-down screens and hurricane shutters, large covered outdoor area, zero infinity pool, 3 car garage, full smart home technology wired for security, music, shades and lights and room for a generator all secured within this 2 story concrete block construction home. A boater's paradise with a new sea wall, 100 feet of water frontage and easy access to the Naples Bay with no bridges. Close proximity to the famous Naples' beaches and the celebrated Third Street Shops and Dining. Aqualane Shores Homes: This beautiful Coastal Contemporary waterfront home invites you to the Aqualane Shores neighborhood of Old Naples. This Stofft Cooney design built by Source Construction offers direct waterfront access on Bittern Channel with bay views from the second level. With over 7500 total square feet of living space, this homes open floor plan offers incredible indoor / outdoor living spaces as well as 4 bedroom, 4 full and 2 half baths. In addition to the 2000 square feet of outdoor living space, this home has a great room, office/media room and second floor lounge/media space. The outdoor area living spaces offer everything needed for complete outdoor Florida living. This property offers one of the best direct gulf access boating neighborhoods, a close walk to access all of third streets neighborhood shops and restaurants, as well as our beautiful white sand beaches and the Gulf of Mexico. Aqualane Shores Homes: Located in the heart of Olde Naples on the corner of Gordon Drive and 16th Avenue South, this new construction, two-story, contemporary coastal-style home is set on a beautiful corner lakefront lot and features a highly desirable southern exposure. The tranquil backyard lake provides a serene backdrop for this home, which inspired its name, Serena Vista. Surrounded by mature trees and lush tropical plants, the home is only a few steps from the white sand beaches of the Gulf of Mexico. The 5 bedrooms plus study, 5 ½ bath home has 4,867 square feet under air, and includes a three-car garage. The home was designed by award-winning architect John Cooney of Stofft-Cooney Architects, and was constructed by BCB Homes - a luxury home builder known for their quality construction methods and attention to detail. The luxury finishes and European furnishings - designed by AR Arquitetura & Design, an international award-winning interior design firm - were all hand-selected and imported. The expansive outdoor living area overlooks the tranquil lake and features a heated, infinity-edge pool, spa, custom designed lakeside dock and covered entertainment area complete with fire pit and kitchEN. Aqualane Shores Homes: H.13867 - Magnificent custom two-story home in Aqualane Shores is located perfectly with breathtaking views of Naples Bay and a short walk to the 3rd Street shopping and white sandy beaches. Newer construction, this home offers direct waterfront access on Bittern Channel. This spectacular great room floor plan boasts 5 ensuite bedrooms with 5 ½ baths, including two first floor master suites. A professional chef’s kitchen with top line appliances including Wolf, Sub Zero, Bosch and Miele are an entertainer’s dream. Soaring ceilings with disappearing sliders open to an outside covered entertaining area with a fireplace, outdoor kitchen, and automated hidden screens and shutters. The second floor includes a spacious loft and bar area, an exercise/hobby room and mahogany office opening up to a spacious outdoor entertainment area with fabulous views of Naples Bay. Hand scraped walnut wood floors throughout, and gorgeous design details make this a MUST SEE. A 3-car air-conditioned garage and extra storage garage for kayaks/ boating/fishing equipment. The covered boat house with 13,000 lb lift and a 40 ft extra yacht dock are situated in one of the best direct-access gulf neighborhoods. Aqualane Shores Homes: This waterfront home is on one of the most desirable homesites in Aqualane Shores. The home is impeccably maintained and is a Florida Mediterranean-style home built in 2008 and has approximately 5,200 square feet with a total of five bedrooms and five-and-a-half baths. The first floor has a master bedroom with a large master bath, gracious living room and dining room with wet bar, family room and eat-in chef kitchen with top-of-the-line appliances, cabinets and countertops, study with built-in cabinetry and a pool bath, half bath and laundry room. The second floor which can be entered by a beautiful circular staircase or a private elevator has four bedrooms, three full baths, media room and large outdoor balcony with views of the water and sunsets. The main outdoor living area is impressive with an infinity edge pool, large covered lanai with roll down screens and a large deck/dock that can accommodate a large yacht with a lift for your tender. Aqualane Shores Homes: Located steps from the beach in the exclusive neighborhood of Aqualane Shores, this magnificent British West Indies-styled home is being sold turnkey in like new condition. Designed by Stofft Cooney Architects, this magnificent residence features a bright open floor plan with indoor living areas seamlessly flowing into outdoor space, creating a year-round tranquil oasis overlooking the pool and lake. Situated in a rarely available and coveted lot boasting 150 foot of frontage on Gulfshore Boulevard South and 87 feet on 17th Avenue South, the property has two separate entrances and is just a stone’s throw away from the Gulf of Mexico. Ground floor master suite and four guest bedrooms with en suite baths offer a luxurious and comfortable living space for family and guests. Highlights include vaulted ceilings with beautiful wood detailing, wide plank dark wood floors, and gorgeous sunset views from the second-floor balcony each evening. Aqualane Shores Homes: H.13236 - Built in 2016, on an oversized, south-facing lot with 153' of water frontage, this home is better than new! Reduced by $550K, now priced to sell! Truly a coastal masterpiece that blends clean lines with timeless styling, creating a distinctive home with the best of everything! Four separate bedroom suites + office, this home's 5,093 sq.ft. of living area is beautifully thought out w/stellar finishes, an open floorplan, towering ceilings and walls of glass letting in copious amounts of natural light. Great room design, gas fireplace, gourmet kitchen, top-of-the-line appliances, 3-bay collector’s garage. The lanai boasts 1500 sq ft of flexible, covered, outdoor entertainment space w/automated screens & shutters, featuring a full summer kitchen, gas grill, fireplace, pool-side lounge & bathroom. Tie up your boat in your private boathouse and throw the catch of the day on the grill! Gorgeous infinity edge pool, spa, deep water canal, just seconds from Naples Bay & the Gulf! Ultra luxurious private master suite w/separate bathrooms and huge closets. Just minutes to the beach or famed 3rd Street shopping/dining. Call today, and live the life you deserve in Aqualane Shores! Aqualane Shores Homes: Take a stroll down to 3rd Street South or the white sandy Gulf beaches from this superbly updated Florida style home located on the coveted waterfront location of Sixth Street South in Aqualane Shores. This impeccable 2009-build residence features 6540 square feet under air, an open floor plan, soaring ceilings, and a glorious outdoor living area on both levels. With a total of 6 bedrooms and 9 bathrooms, generous Chef's style kitchen with tasteful custom cabinetry, Wolf, Sub Zero and Bosch appliances, formal dining room and breakfast bar, living room with a fireplace, family room, 2 laundry rooms, 3 car garage, bonus room and elevator. Flooring is marble and wood throughout. The professional décor has casual elegance to please any modern luxury buyer. Western exposure means breathtaking sunsets are waiting to be seen from the striking infinity edge saltwater pool & spa. Wide canal location with direct access to Naples Bay and the Gulf. A 70 ft boat and jet ski dock will accommodate a yacht for boating and sunset cruises year round. Aqualane Shores Homes: Ideally situated on a quiet tropical stretch in the heart of Aqualane Shores yet mere steps to the beach and 3rd St S, 450 17th Ave S is an awesome vacation retreat befitting the Neapolitan lifestyle. Boasting coveted southern exposure for all day sun, this modern Tuscan style home masterfully combines an open floor plan and soaring ceilings to perfectly frame the inviting outdoor amenities just beyond. The two story dramatic entry with serpentine staircase and ornamental railing are an introduction to the home’s quality and styling. First floor master wing with 4 en suite bedrooms are impeccably designed and built for privacy and tranquility. Incomparable outdoor living area with Wolf range, infinity edge pool and spa coupled with a 60 ft. linear deepwater dock and 36 x 20 ft. covered boat slip makes this a resort- style property. The oversized 3 car garage with car lift, custom Ruffino Cabinetry, state of the art A/V and security system, impact doors and windows and masterful finishes make 450 17th Ave S one of Aqualane’s premier luxury vacation destinations. Aqualane Shores Homes: Currently the largest available western exposure site on a wide water Cove in Aqualane Shores. Superior location, size and setting. ***** Nearly one-half acre, preferred rectangular lot, 100 feet of water frontage, plus up to 190 feet of depth … will proportionately accommodate your waterfront estate. ***** Direct Gulf access through the preferable Gordon Pass, free of any bridges along the way. ***** Enjoy the sunsets and holiday fireworks on the beach from the privacy of your lanai. As Flamingo Cove’s wide water welcomes large boats, you are ready to go with 80 linear feet of dock plus large cut-in boat lift. ***** Your family & guests will enjoy the Mahogany tree lined walk of less than 25 houses to the beach, or stroll to Third Street South’s renowned array of shops & restaurants. ***** Purchase this location today, and take your time envisioning your ultimate tropical dream home … then choose the best builder for your choice. ***** Great Homes always begin with Great Sites. Aqualane Shores Homes: Ideally sited in one of Naples’ most desirable locations close to Third Street South and Naples Bay, this captivating four bedroom plus a den, five bathrooms waterfront residence is one to be desired. Positioned with southern exposure, this boater’s dream spans over 4,300 square feet of open living spaces that transition effortlessly to the outdoors. Wood floors, volume ceilings, a gourmet chef’s kitchen with well-appointed appliances such as Viking gas range, and Sub-Zero refrigerator, a spacious first-floor master suite, and private study are just a few of the highlights of this extraordinary home. Three large en suite guest bedrooms upstairs with separate loft area and covered balconies provide extra comfort for family and guests. A covered lounge area with fireplace and summer kitchen with Lynx grill, flow to a private heated pool and spa. A boat dock with 24,000 lb. lift is poised with no bridges to the open bay for a true boater's dream. Aqualane Shores Homes: REDUCED $450,000! THE LOWEST PRICED WIDE WATER AQUALANE SHORES HOME FOR SALE AND FEATURING OVER 135' OF WATERFRONT! A spacious 2 story main living room open to the kitchen with the master bedroom and office on the main level. Upstairs or by elevator, there are 3 bedrooms and an open sitting area. Ideally situated on an oversized deep water home site and within walking distance to the sugar sand beaches of Olde Naples and 3rd St fine shopping and dining. 215 feet on the North side of property provide an a very rare extra driveway/yard and easy access to the docks for the boating enthusiast. The small dock/lift extending into the canal is grandfathered from the original owner and rarely found in Aqualane Shores providing room for multiple boats. The pool level of the home features an additional 1400 sq ft of air conditioned entertaining area off the newly renovated pool and spa area. The home features stone flooring, stone countertops, gourmet kitchen, impact windows, new interior paint, elevator, outdoor kitchen, oversized garages, and front and rear 2nd floor patios. A tremendous value and rare offering for the wide water streets within Aqualane Shores. Aqualane Shores Homes: Ideally located in prestigious Aqualane Shores yet steps to the beach and 3rd St S. Dock your boat at the private boat dock with 16,000 lb. lift capacity. Boasting the coveted Southern exposure for all day sun on the pool and boat dock. Special highlights of the home include four en-suite bedrooms, gracious gourmet kitchen with Wolf gas range, Sub-Zero refrigerator, gas instant hot water throughout, large and inviting living room ideal for entertaining, with an enchanting gas fireplace in the living room, Acacia hardwood floors, cathedral ceilings, and all overlooking pool and water views. The master suite is enriched with two walk-in closets and a luxurious spa bath. Enjoy your formal dining room to entertain a multitude of guests. Home was built in 2012 with Hurricane Impact Windows and Doors and hurricane shutters were added on the patio. Sprawling entertaining spaces flow outside to the generously sized patio area that can be enjoyed year-round. Easy and direct access to the Gulf of Mexico. Located in an ideal location close to Gordon Drive, and just minutes to the beach. Aqualane Shores Homes: PRICE REDUCED! OWNERS WILL CONSIDER ALL OFFERS! REALTORS, PLEASE SEE FINANCIAL INFO IN THE CONF, REMARKS JUST 3 years new. Designed by Don Stevenson of Lotus Architecture and built by Gordon Luxury homes, it is Located only 1.5 blocks to Naples Beach, and 1.5 blocks to 3rd Street. This beach home sits on one of the small lakes in Aqualane Shores owned by the home owners and not the city. Back yard offers an in-ground spa, which flows into the pool. There is a bonus room under cover by the pool, and tons of room for family, guests, and epic parties. This is a MUST SEE! There are three large bedrooms, and three and a half large bathrooms. The kitchen is state of the art with top brand appliances and opens to the dining and living rooms. There is a gas fireplace in the living room adding warmth and ambiance. The stunning wood floor adds to the richness of this beach home. There is a long deck which looks over the lake . With three over-sized garages and two driveways, there is plenty of room for multiple vehicles. There is a large storage room on the ground floor, security system, and elevator. Aqualane Shores Homes: CERTIFIED APPRAISAL above asking price!! This home has all new Ruffino Cabinetry kitchen and baths, large rooms high ceilings and an amazing open floor plan. For Boaters, large covered boat slip, heavy duty lift, full length dock and new sea wall. Multiple entertaining areas and Southern Exposure. Open and comfortable living... Full length Lanai with built in heating elements and an incredible outdoor space, two professional gourmet kitchens, six fireplaces, SONOS entertainment system throughout, bevelled sliding glass doors. This is a very comfortable home that lives extremely well, very economical and private. Many furnishings and games are included to continue the fun. For storm protection the home has Motorized Hurricane Shutters on the back, hurricane windows on the front and enforced garage doors, as well as an Elevator. There is an extra set of wrought iron doors in the garage that also fit the front door. You can walk to 3rd St. S. and the Beach in minutes. The photos don't say enough. MUST SEE!! Aqualane Shores Homes: This residence is one of Aqualane Shores premier addresses. Calling all Boaters...Boaters Dream that includes a covered boat lift, recently renovated boat dock, 2 jet ski lifts and easy access to Naples Bay with no bridges to boat into the Gulf of Mexico. One of the features that sets this home apart is water views from both the rear and front providing calm vistas to enjoy while in residence. This 4 bedroom plus den has had some tasteful updates. The kitchen has a generous island countertop, large breakfast bar and Sub Zero side by side refrigerator/Freezer. There are multiple sitting areas around the house to take in the water vistas including a front porch, back lanai and upstairs balconies. Aqualane Shores Homes: Location...Location...Location! 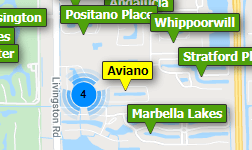 Just 2 blocks to 3rd Street bistros, 3 blocks to the beach, and 14 sites to Naples Yacht Club and Naples Bay. Very quick, no-bridges direct access to Naples Bay. Delightful southern exposure. Huge cathedral ceilinged Great Room with expansive views overlooking 46 ft. pool with cascading spa (electric heater & chiller for hot weather swimming). Wonderful home for entertaining family and friends! Gracious open kitchen with rich warm cherry wood cabinetry, granite countertops, wet bar, walk-in pantry. 90 ft. dock with 13,500 lb. lift. A finest opportunity in the waterfront community of Aqualane Shores. Home was completely remodeled in 2000, Pool was redone in 2015. Aqualane Shores Homes: H.14082 - Best value in Aqualane Shores. Extensively remodeled Old Florida home with a zen garden influence both inside and out. Located on the idyllic tree-canopied 18th Avenue South in Aqualane Shores and Duck Channel, includes dock and boat lift. Enjoy features including bamboo flooring, updated kitchen and bathrooms, whole house generator with 500-gallon propane tank, or transform this perfect Aqualane Shores .32-acre homesite into your new construction masterpiece. The Gulf of Mexico is minutes away by boat or a brief walk down the street, and the shops and restaurants on Third Street are also a short walk away. The unique, expansive private backyard is a must-see. The property affords adequate room to easily add another bedroom and bath if desired.